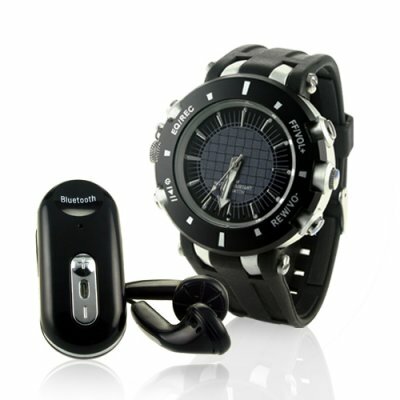 Successfully Added Bluetooth MP3 Player Watch - Built-in 2GB Flash to your Shopping Cart. Sports watch MP3 set, with MP3 and Bluetooth technology built in. Included with the watch comes a high quality Bluetooth stereo headset for either pairing with your MP3 watch and listing to music or for pairing with a mobile phone for handsfree phone calling. This wholesale made in China 2GB MP3 player watch features both MP3 and WMA playing, MIC and Line IN audio recording, A2DP headset and handsfree pairing for the stereo headset as well as a built in MIC on the stereo earphones. Combining the best of two very cool modern technologies, this wholesale priced MP3 watch set is sure to be a hit with all your customers, and is a perfect buy for anyone looking for a special treat for themselves..